Gerard Way and Gabriel Bá’s comic book franchise, The Umbrella Academy, languished in development Hell for almost a decade. While the feature film adaptation never materialized, Netflix’s Umbrella Academy TV series is set to arrive in just a few months. At New York Comic Con, Netflix announced that The Umbrella Academy will premiere on Friday, February 15. The first season of the series will be loosely based upon Apocalypse Suite, the first Umbrella Academy miniseries from 2008. That story found the Hargreeves children reuniting as adults after the death of their adopted father, Sir Reginald Hargreeves. That funeral appears to be captured in one of the first pictures from the series. And on the right hand side, you can see Dr. Pogo, the super intelligent chimpanzee. In the backstory of the series, 43 spontaneous pregnancies in 1989 led Sir Hargreeves to publicly adopt seven of the resulting infants. He told the press that the children would save the world. He even trained them to be a superhero team when they were very young. However, Hargreeves was a harsh teacher and a less than loving father. The so-called family splintered, and they went their separate ways before reuniting in the wake of Hargreeves’ death. For the second picture, we have a better look at the grown up children. 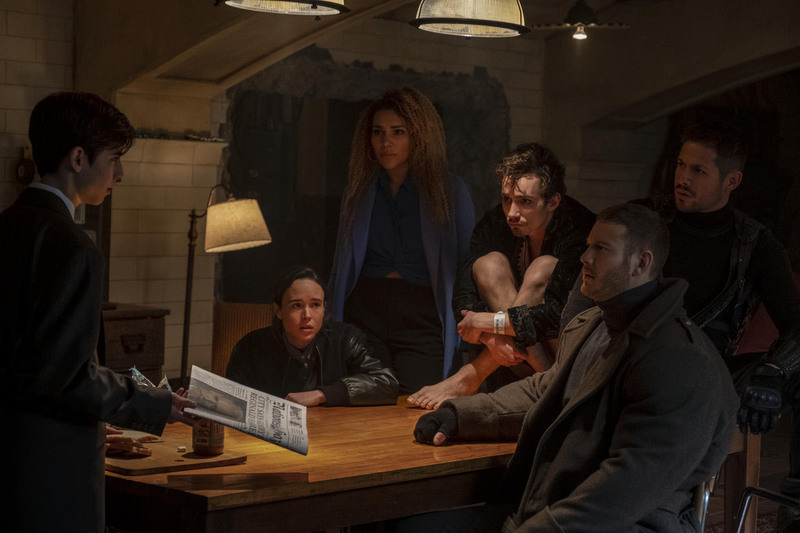 From left to right, we see Number Five (Aidan Gallagher), Vanya (Ellen Page), Allison (Emmy Raver-Lampman), Klaus (Robert Sheehan), Luther (Tom Hopper), and Diego (David Castañeda). Mary J. Blige has a co-starring role in the series as Cha-Cha, with Cameron Britton as Hazel. Colm Feore is also appearing as Sir Reginald Hargreeves a.k.a. The Monocle, with Adam Godley as the voice of Dr. Pogo. 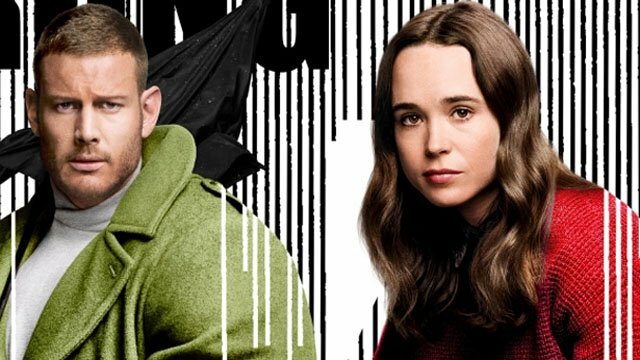 Are you excited about the first pictures from The Umbrella Academy? Let us know in the comment section below!